This design area allows you to add a login area into the design. If the user has an account, they will be able to enter their username and password and click a login button. Then they will be able to access any additional pages in the Site. The code that is required for the Login Form design area is shown below. give_username_focus: this variable allows you to set whether the username box has focus when the page is loaded. By default, this is set to false. The example below sets this value to true, meaning that it will have focus. forward_www_vars: this variable allows you to set whether to forward all GET and POST vars. By default, this is set to false. The example below sets this value to true. 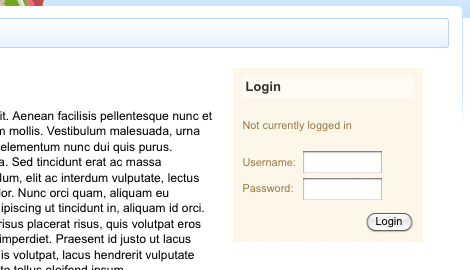 form_open: this variable stats the login and logout form by printing the HTML <form> tag. This is required for this design area. form_close: this variable ends the login and logout form by printing the HTML </form> tag. This is required for this design area. login_heading: this variable will print the heading that has been sent by the operation wanting the login box. For example, on the main Squiz Matrix login box, this is set to Login. login_message: this variable will print the message that has been sent by the operation wanting the login box. For example, on the main Squiz Matrix login box, this is set to You need to login before you can access the backend. password_box: this variable will print the password box. Any extra arguments that can be added to the HTML <input> tag can also be used with variable. For example, in the code below, size="10" is used with this variable. This will set the size of the box to 10 characters. This is required for this design area. referer: this variable will print the URL of the page that the user was last viewing before they got the login box. This URL can be a URL from an external page. submit_button: this variable will print the submit button. Any extra arguments that can be added to the HTML <input> tag can also be used with variable. For example, in the code below, value="Login" and value="Logout" is used with this variable. This defines what text to print on the button. This is required for this design area. system_messages: this variable will print any error messages that the user receives when they are trying to login. For example, if they enter an incorrect password they will receive the message Invalid username or password entered. username_box: this variable will print the username box. Any extra arguments that can be added to the HTML <input> tag can also be used with variable. For example, in the code below, size="10" is used with this variable. This defines the size of the box. This is required for this design area. Below is the HTML code that was added to the static HTML file to show where the login design area should go in the design. The required code is added to the parse file for the Login Form design area, as shown below. The design will now show the login box on the left hand side of the page, as shown in the figure below.